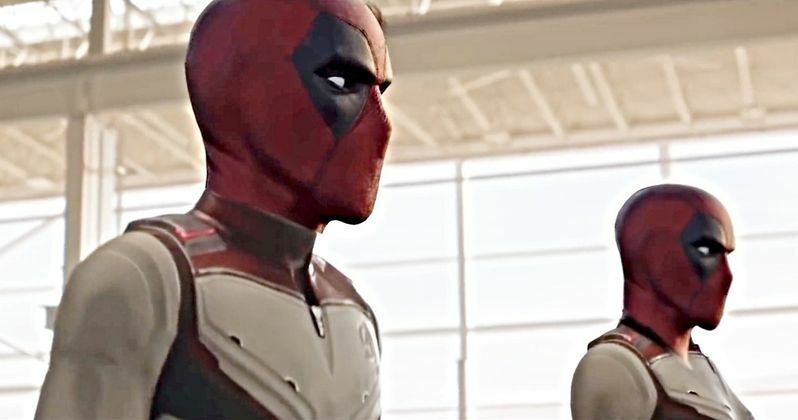 Deadpool offers some hilarious commentary in the latest fan-made Avengers: Endgame trailer. With the Disney and Fox deal set to close, the Merc with a Mouth will be in the vicinity of the Marvel Cinematic Universe soon, though it isn't clear if his movies will come out on the Fox imprint from here on out since he hangs out in the R-rated section of the theater. Disney CEO Bob Iger looks forward to putting out some of Fox's more adult-oriented projects, but some of which will still have the Fox name on them and Deadpool could very well be in that category. While we probably won't see Deadpool hanging out with the Avengers on the big screen, this new fan-made video is the next best thing. We've previously seen the Merc with Mouth infiltrate the first trailer for Avengers: Endgame and last year's Infinity War, but that was just basically putting the character's head on Earth's Mightiest Heroes. Now, Deadpool is running commentary and fixing little things in the trailer, like Steve Rogers' reflection in the window or getting hit with one of Hawkeye's arrows after suggesting that Green Arrow should be in the movie. As is the case with the previous Deadpool and Avengers mashups, this one has excellent quality and may be the best one yet. With that being said, the narrator's Ryan Reynolds impression could use a bit of work, even though the dialogue is spot on. Reynolds enjoyed and shared the last Avengers: Endgame trailer mashup and he'll probably get a kick out of this one too. Sadly, the giant purple Homer Simpson isn't shown off in the latest trailer, so Deadpool seems a little sad about his buddy Cable not being included. Infinity War created a meme frenzy upon its release last year and the purple Homer Simpson gag was something that was spread far and wide. It will be interesting to see what gets picked up in the pop culture vortex this time around when Avengers: Endgame hits theaters next month. Will Goose the Cat from Captain Marvel end up having a cameo and stealing the show again? We've already seen Goose's head pasted on all of the Avengers, which was shared quite a few times. Avengers: Endgame hits theaters on April 26th in theaters worldwide. The hype for the movie is off of the charts and it is arguably the most anticipated movie of the year, even beating out Star Wars 9, which is a huge mystery for the time being. As for Deadpool 3 and X-Force, we're still waiting to see how everything settles with the Disney and Fox deal, though we should have some more information soon. For now, we can just sit back and enjoy Deadpool fixing some problems in the Avengers: Endgame trailer and finding ways to improve everything around him. You can watch the new and improved trailer below, thanks to the Mighty Raccoon YouTube channel.